Kevin Ryan in Tokyo – Page 4 – tokyokevin on Japan. Language. Learning. Tech. Culture. Women. And here we are, nearing the end of the month, the end of the semester here in Japan, and a time when things get creative for me. Materials development, preceded by syllabus writing, along with a research article or two. This week I posted about Noom, a lifestyle app that uses psychology to gradually change habits to the healthier, mostly about eating, but a lot of other aspects come into play as well. A very good program (digital program as well as the way it is managed, with groups and a coach). It could be a model for language education. Working on making something similar using PocketPassport because it works so well on mobile. That is my tech goal this year…go mobile for most of my content. A big project to port and reformulate that stuff from years on Moodle. I will go to the Moodle conference end of February to see if there are any options there. Reads: Poverty can change your life, down to your genes. We need to look at it like a disease. From a guy that made it, by his account, through luck (Nautilus). MOOCs: ” The thing is, moving a university is a little bit like moving a cemetery. You can’t expect any help from the inhabitants.” Barbara Oakley. (HigherEd). Short Story: Language and tech, in dystopia Sort by Controversy by Scott Alexander. Similar to Lexicon, a book I finally recovered from Amazon and am about to read. Retirement planning, still years down the road, but jockeying for a supplement to get some money to have fun (a nice position to be in). Should I teach online? Somebody wants me to, so they can make my life easier and make money off me too. Poetry. 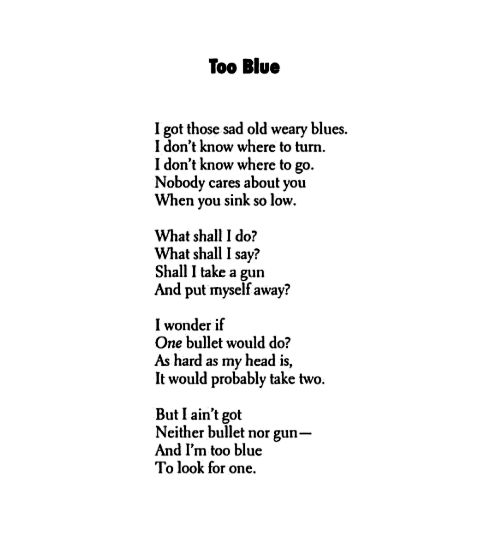 I don’t read much, but this resonated earlier this week when I got my schedule for next year (I know, first world problems), but I am no longer Too Blue (Langston Hughes). This poster took me out of the funk. Politics: Matt Taibi writes the best article of the week on why Alexandria Ocasio-Cortez rocks. (Rolling Stone). Gender and pay gaps. A simple solution: make everyone’s pay public. Sounds counterintuitive, but it works. Really. Tech: Tim O’Reilly on 10 transitions moving Gradually, then Suddenly into the future. A great introduction to my IT class in April, I think. Surgery. On yourself. Could you do it? This guy did. I get light headed even thinking about it. NFL: (That’s US football). Good news about possible demise. Nobody wants to insure them anymore. Capitalism in action, or like convicting Al Capone for tax fraud? Health: A follow-up from Noom. It uses lots of different #psychTricks, and one of them is to listen to your body (duh). But it turns out there is a whole field out there about Intuitive Eating. Time Magazine best 100 photos. A great classroom resource. Can be used with or without planning. I wrote about my (now) 3-week ordeal when a tech over at Amazon.uk (Vishnu, you should be fired) for cancelling BOTH my UK and US account when I asked him to leave the US one alone. Three times. My 5th attempt I tried using some ALL CAPS while writing in the chat with the support tech person. When the final result was another promise to email me with the login details, 4 times before without results, I asked who the boss was, and got a name. THIS time, I actually DID receive and email. But it directed me back to support. I click on the link, and I am back at square one. I go through the same process with the new tech, hoping this time something different would happen. Nope. SO I START YELLING FOR THE BOSS, FLIPPING OUT and pointing out this was my sixth attempt. The tech finally put me in contact with his boss, who discovered the problem and had my old account reinstated in less than 3 minutes. The lesson from all this? I am going to find a way to save all my Kindle books locally, so I am not dependant on Amazon su- su- su- sucky support. Also, I am downloading all my highlights from books past. You never know how much you depend on something until you lose it. I was fortunate to get it back.